Home > Sports > End of Sachin Era!!!!! Sachin Tendulkar has been the most complete batsman of his time, the most prolific runmaker of all time, and arguably the biggest cricket icon the game has ever known. His batting is based on the purest principles: perfect balance, economy of movement, precision in stroke-making, and that intangible quality given only to geniuses - anticipation. If he doesn't have a signature stroke - the upright, back-foot punch comes close - it is because he is equally proficient at each of the full range of orthodox shots (and plenty of improvised ones as well) and can pull them out at will. There are no apparent weaknesses in Tendulkar's game. He can score all around the wicket, off both front foot and back, can tune his technique to suit every condition, temper his game to suit every situation, and has made runs in all parts of the world in all conditions. Some of his finest performances have come against Australia, the overwhelmingly dominant team of his era. His century as a 19-year-old on a lightning-fast pitch at the WACA is considered one of the best innings ever to have been played in Australia. A few years later he received the ultimate compliment from the ultimate batsman: Don Bradman confided to his wife that Tendulkar reminded him of himself. He currently holds the record for most hundreds in both Tests and ODIs - remarkable, considering he didn't score his first ODI hundred till his 79th match. Incredibly, he retains a divine enthusiasm for the game: at 36 years and 306 days he broke a 40-year-old barrier by scoring the first double-century in one-day cricket. In 2012, when just one month short of his 39th birthday, he became the first player to score 100 international centuries, which like Bradman's batting average, could be a mark that lasts for ever. Later that year, though, he announced his retirement from ODIs after a disappointing 18 months in international cricket. 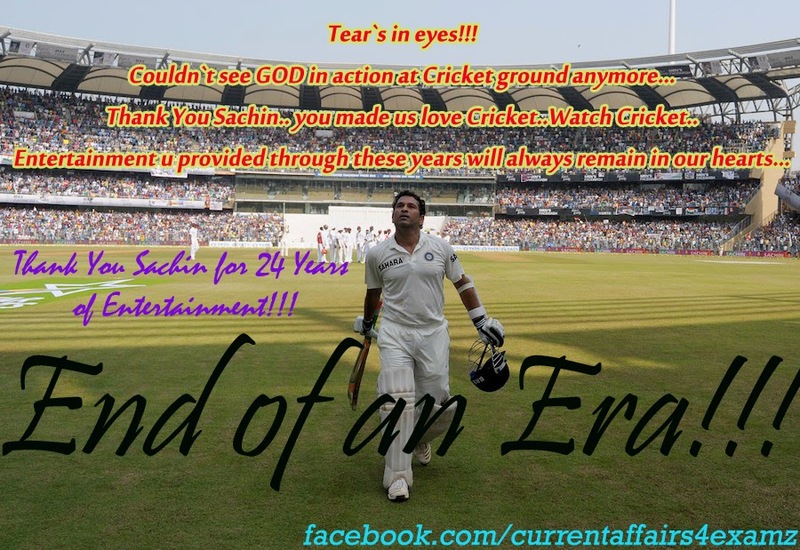 In October 2013, having played 198 Tests, Tendulkar announced that he would quit the longest format after playing his 200th Test, at home against West Indies. Tendulkar's considerable achievements seem greater still when looked at in the light of the burden of expectations he has had to bear from his adoring but somewhat unreasonable followers, who have been prone to regard anything less than a hundred in each innings as a failure. The aura may have dimmed, if only slightly, as the years on the international circuit have taken their toll on the body, but Tendulkar remains, by a distance, the most worshipped cricketer in the world.